In Hinduism, Kalki (कल्कि) is the final incarnation of Vishnu in the current Mahayuga, foretold to appear at the end of Kali Yuga, the current epoch. 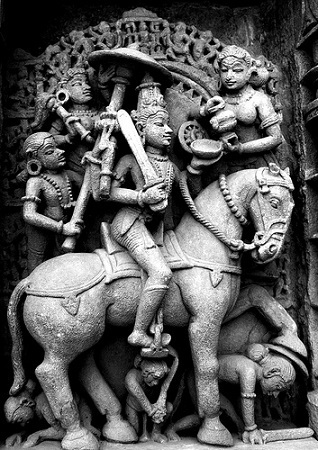 Religious texts called the Puranas foretell that Kalki will be atop a white horse with a drawn blazing sword. He is the harbinger of the end time in Hindu eschatology, after which he will usher in Satya Yuga. In Buddhist Kalachakra tradition, 25 rulers of the Shambhala Kingdom held the title of Kalki, Kulika or Kalki-king. During Vaishakha, the first fortnight in Shukla Paksha is dedicated to fifteen deities, with each day for a different god. In this tradition, the twelfth day is Vaishakha Dwadashi and is dedicated to Madhava, another name for Kalki. It is said that Lord Kalki will remove the darkness of kali yuga and establish a new yuga (age) called Satya yuga (Age of Truth) on the earth. Satya yuga is also known as Krita yuga. Similarly, as per the characteristics of the next cycle of four yugas, the next satya yuga will be known as Panchorath Yuga. The earliest reference to the Kalki Avatar is found in the India’s great epic, the Mahabharat. Rishi Markandeya tells Yudhishtir, the seniormost Pandava, that Kalki will be born to Brahmin parents. He would excel in academics, sports and warfare, and thus become a very intelligent and powerful young man. Lord Kalki will appear in the home of the most eminent brahmana of Shambhala village, the great souls Vishnuyasha and his wife, the pure of thought Sumati. Vishnuyasha refers to the father of Kalki as a devotee of Vishnu while Sumati refers to His mother in Shambhala, or the temple of Shiva. The Agni Purana predicts that at the time of his birth, evil kings will feed on the pious. Kalki will be born son of Vishnuyasha in the mythic Shambhala. He will have Yajnavalkya as his spiritual guru. 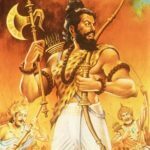 Parashurama, the sixth avatar of Vishnu is a Chiranjivi (immortal) and in scripture is believed to be alive, waiting for the return of Kalki. He will be a martial guru to the avatar, instructing him in the performance of a severe penance in order to receive celestial weaponry. Kalki will establish moral law in the form of the fourfold varnas, and organize society into four classes, after which there will be a return to the path of righteousness. The purana also relates that Hari, will then give up the form of Kalki, return to heaven and the Krita or Satya Yuga will return as before. When the practices taught in the Vedas and institutes of law have nearly ceased, and the close of the Kali age shall be nigh, a portion of that divine being who exists of His own spiritual nature, and who is the beginning and end, and who comprehends all things, shall descend upon earth. He will be born in the family of Vishnuyasha, an eminent brahmana of Shambhala village, as Kalki, endowed with eight superhuman faculties, when the eight suns (represented by 8 solar deities or Vasu who lord over Dhanishta Nakshatra) will together shine over the sky. By His irresistible might he will destroy all the mlecchas (Barbarians) and thieves, and all whose minds are devoted to iniquity. He will reestablish righteousness upon earth, and the minds of those who live at the end of the Kali age shall be awakened, and shall be as clear as crystal. The men who are thus changed by virtue of that peculiar time shall be as the seeds of human beings, and shall give birth to a race who will follow the laws of the Krita age or Satya Yuga, the age of purity. As it is said, ‘When the sun and moon, and the lunar asterism Tishya, and the planet Jupiter, are in one mansion, the Krita age shall return. The Padma Purana describes that Kalki will end the age of Kali and kill all mlecchas. He will gather all brahmanas and propound the highest truth, bringing back the ways of dharma that have been lost, and removing the prolonged hunger of the Brahmin. Kalki will defy oppression and be a banner of victory for the world. At the end of Kali Yuga, when there exist no topics on the subject of God, even at the residences of so-called saints and respectable gentlemen, and when the power of government is transferred to the hands of ministers elected from the evil men, and when nothing is known of the techniques of sacrifice, even by word, at that time the Lord will appear as the supreme chastiser. 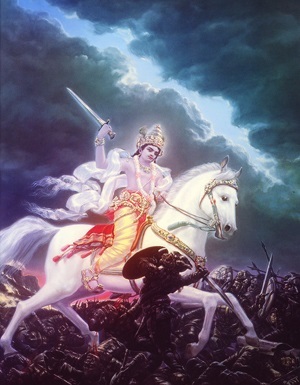 The ascetic prince, Lord Kalki, the Lord of the Universe, will mount His swift white horse Devadatta and, sword in hand, travel over the earth exhibiting His eight mystic opulences and eight special qualities of Godhead. Displaying His unequaled effulgence and riding with great speed, He will kill by the millions those thieves who have dared dress as kings. The Kalki Purana combines elements of earlier scriptures to describe Kalki. He will have the power to change the course of the stream of time and restore the path of the righteous. The evil demon Kali will spring from the back of Brahma and descend to earth and cause dharma to be forgotten and society to decay. When man stops offering yagna, Vishnu will then descend a final time to save the steadfast. He will be reborn as Kalki to a Brahmin family in the city of Shambhala. Followers of Tibetan Buddhism have preserved the Kalachakra Tantra in which “Kalkin” is a title of 25 rulers in the mystical realm of Shambhala. This tantra mirrors a number of prophecies of the Puranas. His arrival is stipulated at a time when the earth is engulfed in crisis because of a tyrannical and powerful ruler. Kalki Bhagwan is said to be mounted on a strikingly beautiful White Horse, and is most often picturised in the foreground of a dark sky. This symbolises his coming at a time when darkness (evil) is the order of the day, and he is the saviour to rid the world of its sufferings. This is similar to the Parashuram avatar, where Lord Vishnu killed the atrocious Kshatriya rulers. The Kalki Avatar is the most eagerly awaited one, more so because it will signify the cleansing of the world from all its sorrows that have been accumulated for many millennia. He is to arrive at the end of Kalyug, the dark age, and will mark the beginning of the Sat Yug. 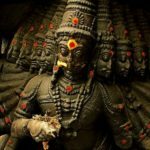 According to calculations, there are still many years left for that to happen (The Kalyug extends for a period of 432000 years, and it has just started – 5000 years ago). When we have such advanced military technology today, it will be interesting to see (though we may not, unless we do not manage to attain salvation by then, and are still caught in the rebirth cycle) what kind of weapons Kalki Avatar utilises. It is also said that Kalki avtar will come, when all the three rivers Saraswati, Yamuna and Ganga return to heavens ( dried).